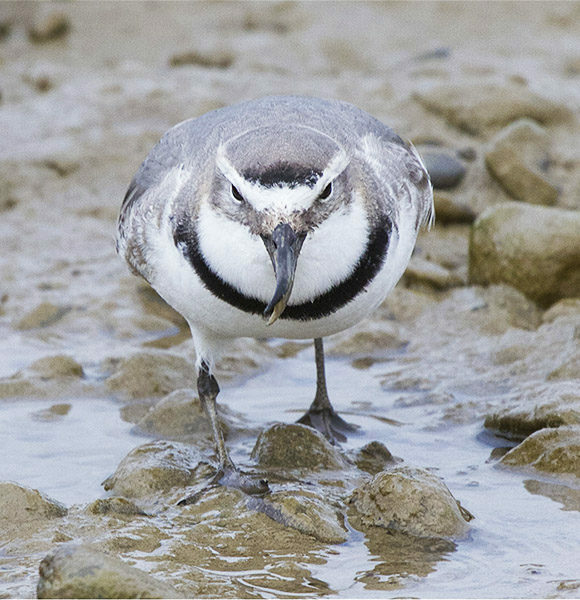 A species of plover endemic to New Zealand, it is unique in that it is the only species of bird in the world with an asymmetrically bent bill (always bent to the right), which it evolved to reach aquatic insect larvae under the rounded riverbed stones on braided rivers. Measuring 20–21cm long and weighing between 43–71gm, they are slightly sexually dimorphic. The male has a white forehead and pale grey crown, nape, back, wings and tail and a white throat, breast, belly and rump, with a thin black band across the breast. 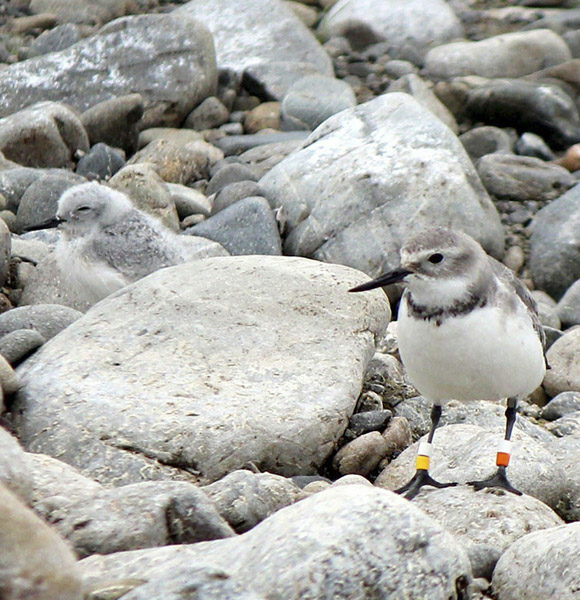 This band is thinner in the female, and much less distinct in both sexes in the non-breeding season. Males have a small black bar between the white forehead and the grey crown. As with the breast band, this is reduced in the non-breeding season. Wrybill migrate to the Ashley-Rakahuri River in mid-late August from their winter feeding grounds in North Island estuaries, where they form dense flocks. On the river, however, they nest in solitary pairs, sharing incubation up to 36 days, and will vigorously defend their territory against other wrybills. 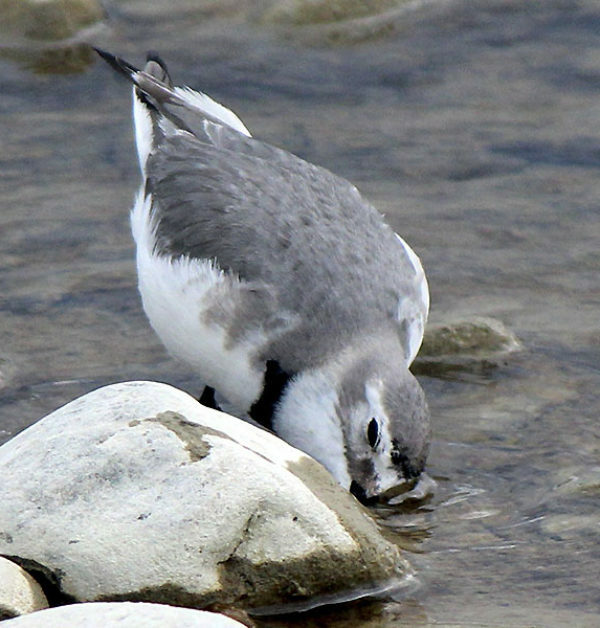 Once prevalent on smaller rivers, the wrybill’s range has contracted to about 60% of its estimated original habitat. 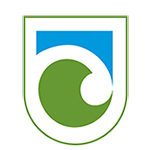 Numbers appear to have been relatively stable on the Ashley River during the last few decades, with up to 10 pairs breeding in recent years. They prefer to nest on large dynamic rivers with weed-free bare shingle. Their eggs are blue-grey and lightly speckled, making them well camouflaged against river stones and pebbles, which generally make up the main structure of a very simple nest. Their camouflage makes them and their nests hard to see (can you find the pale blue eggs among the stones in the photo below?). Chicks must fend for themselves after hatching; they freeze to escape detection, swim well from a few days old, and fledge after 35-40 days. They prefer to nest on large dynamic rivers with weed-free bare shingle. Their eggs are blue-grey and lightly speckled, making them well camouflaged against river stones and pebbles, which generally make up the main structure of a very simple nest. Their camouflage makes them and their nests hard to see. Chicks must fend for themselves after hatching; they freeze to escape detection, swim well from a few days old, and fledge after 35-40 days.